I have created one role to display transactions that can be executed by a user. After executing the transaction ( S_BCE_68001426), it shows relevant information. I want to save this information in a excel file. 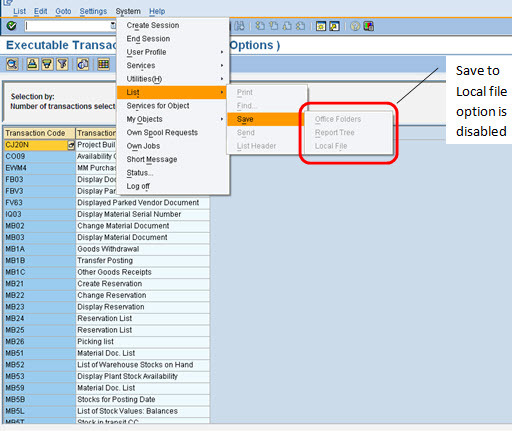 But if I execute this transaction ( same is the case some other Transactions) with user having SAP_ALL, I get the option to save output to local file. I have attached the screen-shots for your reference. go to su53 and check the obect .. then give the full auth.. of the object. Definitely there is some problem with missing authorization. Since those options are disabled, it does not result in missing authorization. So when I run SU53, it does not show missing authorization but says last authorization check was successful. Adding authorization object S_GUI has solved the problem. Adding authorization object S_GUI in role has solved the problem.